and 60% of second marriages will end in divorce. 1 in 100 marriages ended. In total there’s a divorce in America every 13 seconds. 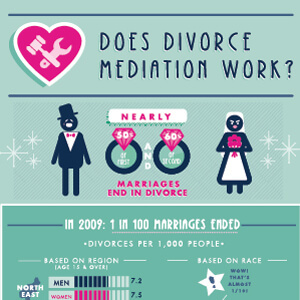 Many of those divorces will be settled with mediation. Mediation produces agreement in 50-80% of cases. Humor, optimism, empathy, sympathy, friendliness. Quickly grasp complex issues, shift tactics rapidly. This should be about your problem, not a mediator with a problem understanding you. Prepared, controls own feelings, neutral, hard worker. Imagine coming to an agreement with three warring parties. State, Local, County Court, continuing education, and ACR (Association for Conflict Resolution) training. Mediation: Financial info, discussions and decisions confidential. Litigation: Becomes part of the public record. Hearings open to public. Note: And it’s less adversarial. But if it doesn’t work you have to start from scratch. It’s up to you, but for many it’s worth a shot.